General Finishes Enduro Conversion Varnish - Professional Use ONLY! 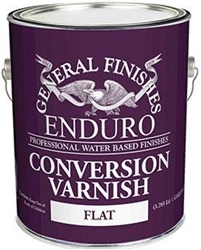 General Finishes Enduro Conversion Varnish is a professional use, post catalyzed, high solids, two component urethane formulated for ultimate durability and chemical/moisture resistance in a waterbased system. This finish is intended for professional or industrial applications and requires advanced personal protection and precautions for safe use. It is NOT intended for use in home shops or other non-professional applications. GF Conversion Varnish represents the latest in 2K Urethane technology. It is quick drying and resists yellowing. It can be applied over other General Finishes products and most other solvent products (sample panels should be prepared to validate compatibility). GF Conversion Varnish uses an Aliphatic Poly Isocyanate Catalyst (10% by volume) with a 6-8 hour pot life. It can be pigmented and used for interior or exterior applications. Recoat in 1-2 hours with full cure in 7 days. Pricing shown includes the necessary quantity of catalyst for the product volume. Clear Finish over tinted Base colors.